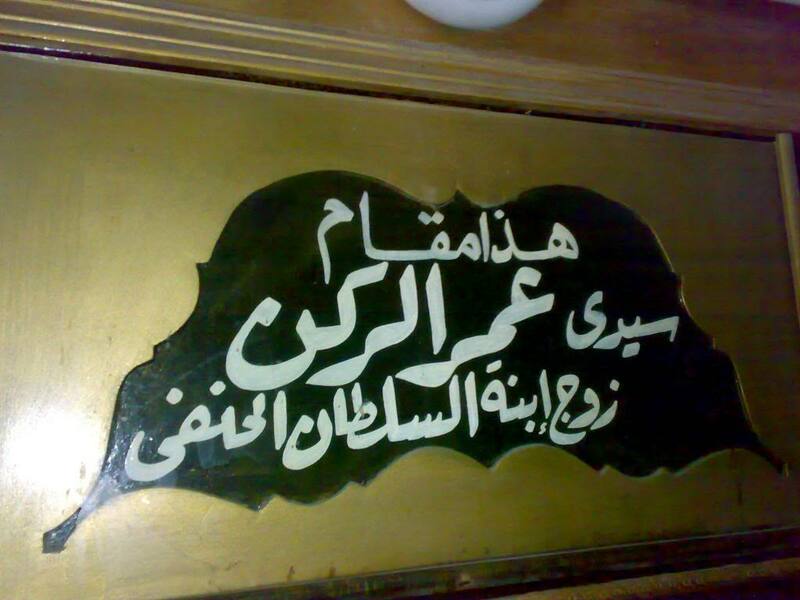 who took it from Sayyiduna Imam Abu’l-Hasan al-Shadhili. He is the qutb and matchless pearl of his time, the shaykh of gnostics, and the sultan of saints. He is the treasury of the elect, the well of secrets, the manifestation of the suns of spiritual lights, the fifth caliph, and the heir to the secrets of mystics. He is the one whom Allah established as a mercy to His servants, both in his own life and after. He is our liege and master, crown of the broad Islamic path and din, who leads wayfarers to their spiritual destination. He is the sign of God on earth crowned with secrets. He is adorned with the garment of the folk of truthfulness, unearthing wonders from the spiritual path, and the meanings of whose words dazzled perspicacious intellects. He is the master of young and old, the shelter of the folk of stability and firmness, the unparallelled qutb, the single and collective succour, our master Shams al-Din, Sultan Abu’l ‘Abdullah Muhammad b. al-Hasan b. ‘Ali al-Hanafi, may Allah be pleased with him and may He make him pleased. May Allah support us by his spiritual sustentation and encompass us by His pleasure. He was from the most illustrious shaykhs of Egypt and from the masters of gnostics. He was regaled with manifest miracles, splendid states, radiant stations and lofty spiritual ambitions. He was endowed with a pleasing spiritual illumination, a disclosure tearing apart the veils of normality, a promacy in the inward aspects of sanctified purity, ascension through the stairways of gnosis, and elevation across the ladders of ultimate realities. He was among those who ruled over his secrets, curbed his states and seized control of his affair. He possessed far-reaching authority in effectively disposing of matters, a beneficent hand in judgments pertaining to sanctity, a firm foot in the steps at the end of the spiritual path, and the towering peak in steadfastness and solidity. He is among the pillars of this path, the vanguard of its pivots [awtad], its foremost imams and the cream of its scholars — in knowledge, action, state, word, abstinence, revival of the pristine way of tawhid, awe, and majesty. He is from those whom Allah Most High manifested unto existence, shifting around in the cosmos, entrenching in spiritual states, causing to verbalize aspects of the invisible world, bestowing benefits on their tongues and establishing as a model for seekers, so that a group of path’s folk graduated in his school and numerous men of virtue and saints affiliated to him, acknowledging his merit and endorsing his status. As a result, people sought him out from other regions, while he unlocked ambiguous issues concerning the states of the Sufis. He — may Allah be pleased with Him and benefit [us] through him — was born in Egypt in AH 775. He grew up under the tutelage of his maternal aunt. When he reached his prime, he went to school and memorized the Qur’an, learnt from Ibn Hisham and heard hadith from our master al-‘Iraqi. After this, he decided to take a break from pursuing knowledge, whereupon he worked in a shop he had set up for himself. He sold books there until a caller of the All-Merciful came to him and said, ‘O Muhammad, you have not been created for this. Give up this shop, since the like of you is not suited to this business. You have a huge affair with Us.’ He accordingly gave up the shop and the stock he would sell in it, becoming preoccupied with love for his Creator and Originator. He then withdrew into a solitary retreat for seven years, and came out manifesting sealed aspects of the ultimate reality, speaking about the secrets of sciences and disciplines, and understanding the recondite meanings of the Qur’an. As a result, the kings of mankind and jinn yielded to his authority and crawled to him, seeking to flatter him, while luminaries attested the fact that he had a vast affair among humans. They were saying this out of the bounty of the Lord of mankind. After his retreat, he took the spiritual path and its devotee at the hand of his guide and mentor, who took him to his destination and brought him near Allah, our master Nasir al-Din b. al-Maylaq. He in turn had taken the path from his grandfather, our master Abu’l-Abbas Shihab al-Din b. al-Maylaq, the admonisher and guide who was regaled with saintly miracles and spiritual allusions, and who is buried in the Greater Shadhili Cemetery. He had in turn taken the path from our master Yaqut al-Arshi, who had in turn taken the path from our master Abu’l-Abbas al-Mursi and though him from our master Abu’l-Hasan al-Shadhili. ■ Our master Abu’l-Abbas Ahmad b. Muhammad b. ‘Abd al-Ghani al-Sirsi. His spiritual station was comparable to our master al-Hanafi, and he was gifted spiritual unveilings. He passed away in the year AH 861 and was buried in the Shadhili Cemetery. ■ Our master Shams al-Din b. Katila al-Mahalli. ■ The latter’s in-law, our master ‘Umar, buried in his mosque. ■ Chief Justice Sharaf al-Din Yahya b. Muhammad al-Munawi al-Shadhili. He was — may Allah have mercy on him — a notable. 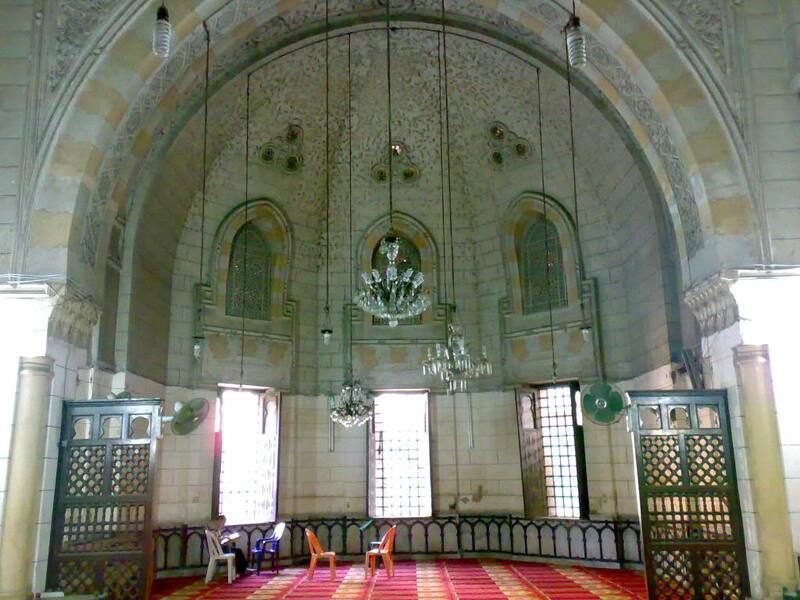 Appointed as the shaykh of the Azhar Mosque, he was given the epithet “Shaykh al-Islam”. He would attend the gatherings of our master al-Hanafi, from whom he learnt and to whom he was closely associated. He would frequent him regularly, time after time. He died in 12 Jumada II AH 871. ■ Our master Siraj al-Din Abu Hafs ‘Umar b. al-Mulaqqin, the author of Tabaqat al-Awliya; who passed away in Rabi’ I in AH 804. ■ [Shaykh ]Al-Siraj al-Bulqini, the mujtahid of his age and the foremost scholar of the eighth century AH. 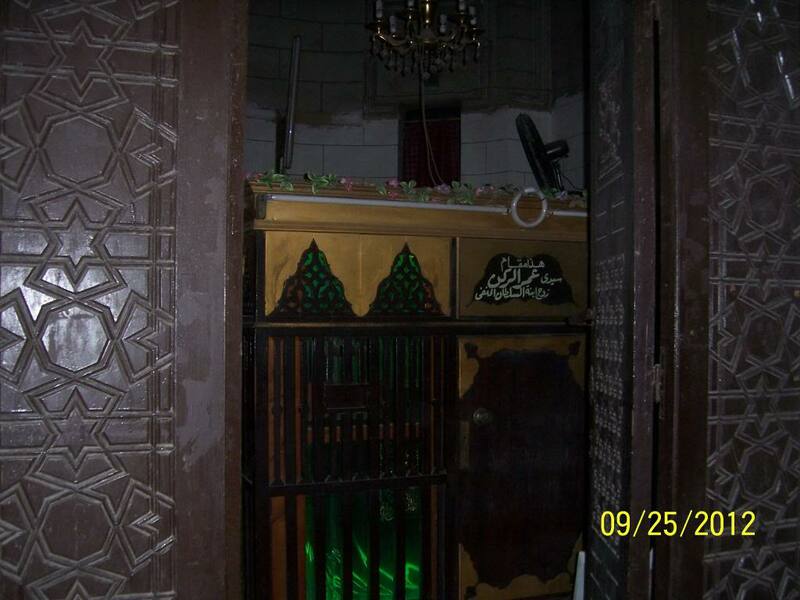 He met his death — may Allah show mercy to him — in 10 Dhu al-Qa’da AH 805, and was buried in the middle of his mosque situated in Bab al-Sha`riyya, by the side of Bayn al-Sayarij. His shrine therein is visited by people. ■ Shaykh al-Islam al-Badr al-‘Ayni, who was the Chief Justice in charge of a notable judiciary, and who died on 4 Dhu al-Hijja AH 855. He was buried in his mosque known in the past in the area of Katama, and presently known in the public square of the Azhar quarter. 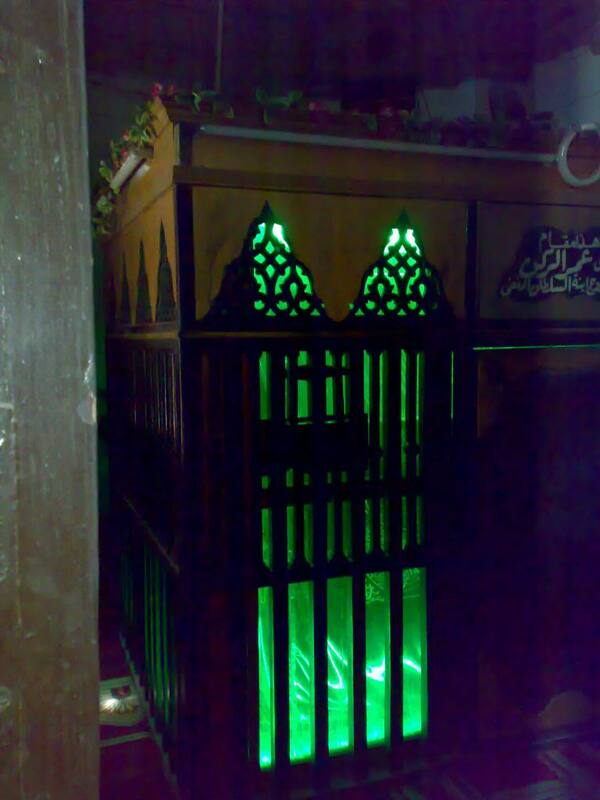 ■ Sidi Shams al-Din’s own son, both biologically and spiritually, our master Mahmud al-Hanafi, buried behind his mosque. ■ Our master Abu Madyan al-Ashmuni, a descendant of Abu Madyan al-Tilimsani. 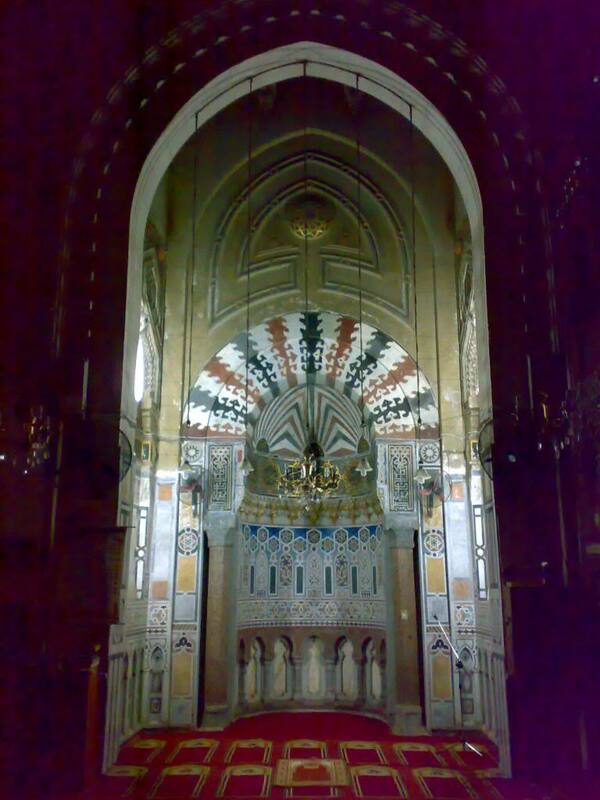 He came to our master al-Hanafi, sat with him for forty days and attained perfection. Thereafter, he developed some virtuous associates and disciples of his. 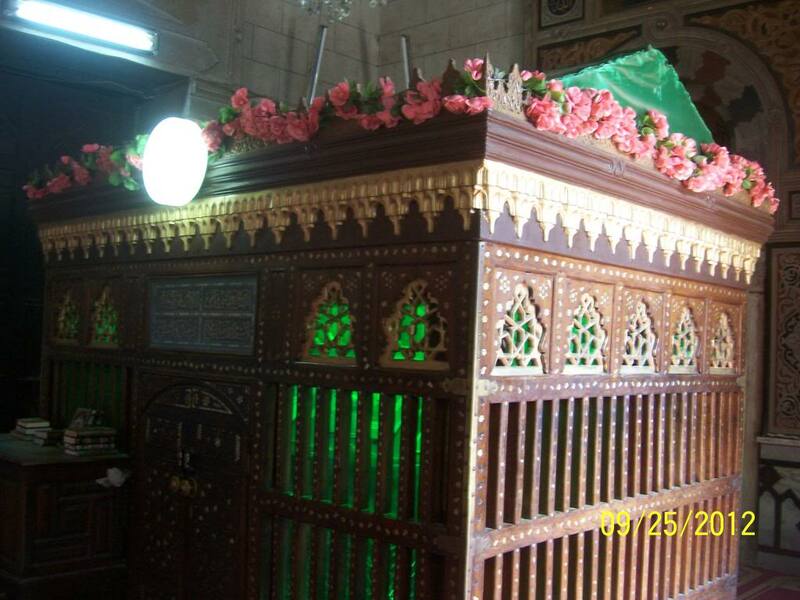 His shrine is named after him in Bab al-Sha’riyya, by a narrow alley in the Muqassam district. Of his children who are buried in his vicinity are Ahmad al-Shuwaymi and Ahmad al-Halfawi, may Allah be pleased with all of them. He had many other disciples, whose number cannot possibly be ascertained. We have limited ourselves to the abovementioned ones. 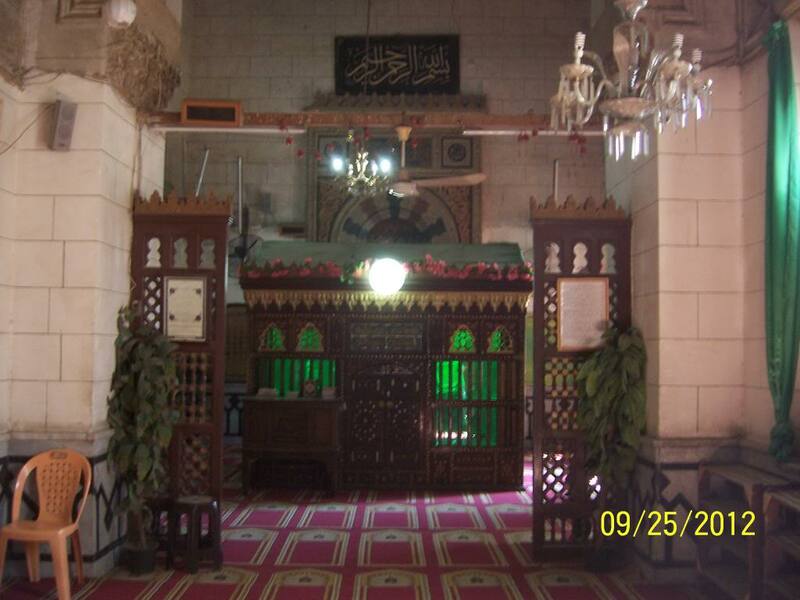 The death of our master Shams al-Din al-Hanafi took place in Cairo in Rabi’ II AH 847. 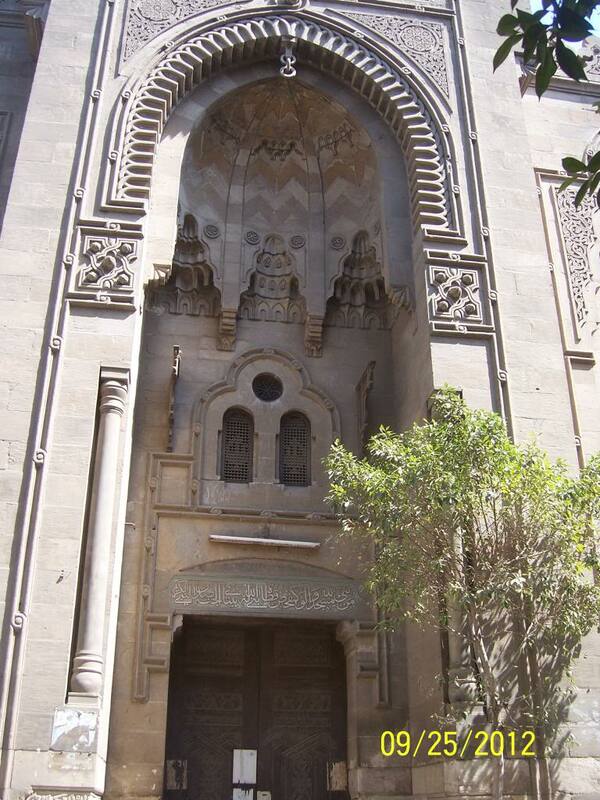 He was buried in his well-known mosque, which is regarded as one of Cairo’s largest. 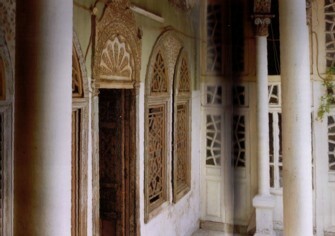 It is built with white stone and hoists a large minbar surmounted by lovely engravings close to it. 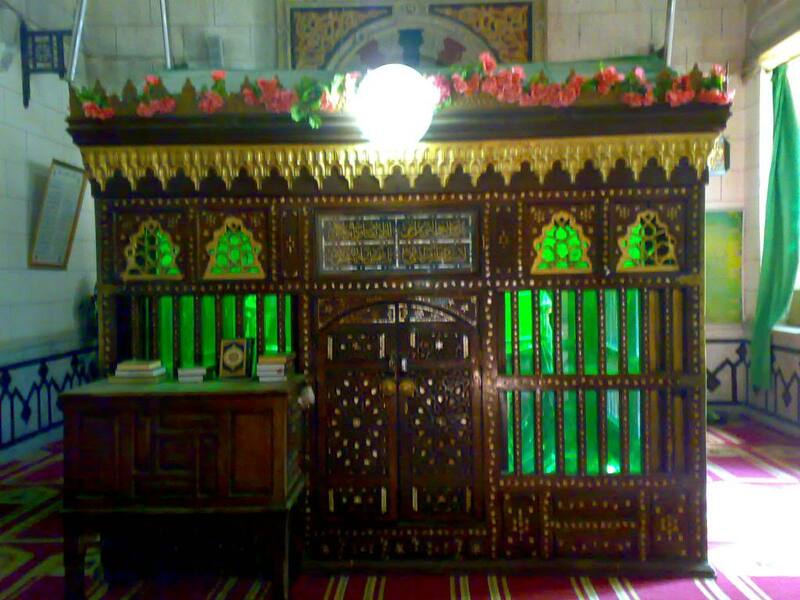 The minbar is made of wood with an oyster veneer. In the courtyard of the mosque, there is an arched dome with coloured glass windows, while the roof of the mosque is made using lapis lazuli and coloured glass. To the right entrance of the large door there is a noble stall where his honourable mausoleum is found, topped by a splendidly constructed dome. Sayyidi Shams al-Din al-Hanafi is one of the axial saints buried in Egypt. People set out for his tomb from far away localities and remote nations, hoping to find abundant good there. A Shadhili public session of remembrance [hadra] is performed there morning and evening. 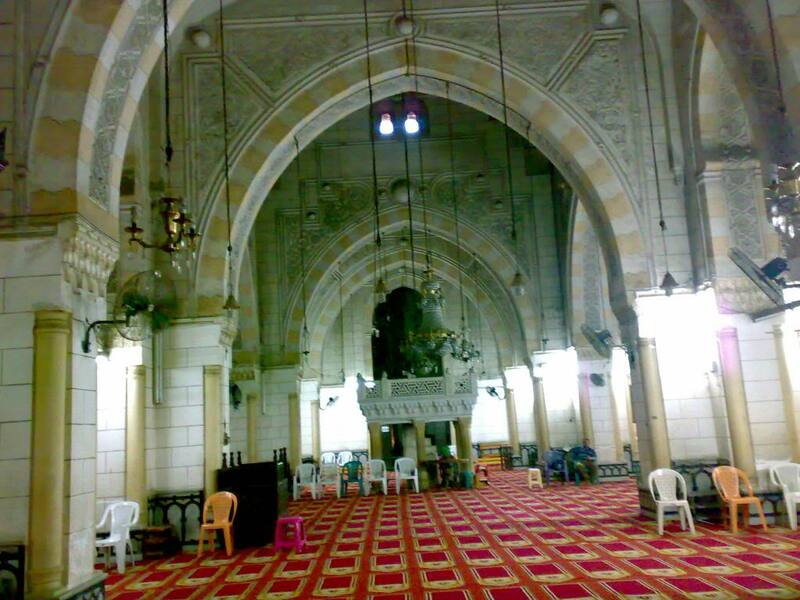 This mosque is regaled with divine manifestations and breezes of goodness. It is redolent with the scents of musk and camphor due to the blessing of its residents, may Allah have mercy on them. No aggrieved person intentionally sets out for this mosque save that Allah helps him and eases his pursuit. Among the things that have been tried and tested is that if somone has a need, he should intentionally visit this mosque three days consecutively after the Dawn prayer. His need will be fulfilled instantly. This matter is established by multiple transmissions among both the elite and commonality of Egypt, and proven by experience. There is no doubt about this. O Allah, nourish us through his spiritual sustentation, settle us in his proximity and delight us by Your pleasure with us, O Allah, O Most Merciful of those who show mercy. You can read his biography in al-A’lam (6/88), Tabaqat al-Sha’rani (2/81-92), al-Kutubkhana (7/396), Dar al-Kutub (1/314), al-Sirr al-Safi (2/93) and Tabaqat al-Shadhiliyyat al-Kubra by Muhyi al-Din al-Tu’mi (p. 187). His biography can be found in Tabaqat al-Shadhiliyyat al-Kubra by Muhyi al-Din al-Tu’mi (p. 150). One of his major students being the great hadith scholar Ibn Hajar Al-Asqalani who continuously refers to him as Shaykh al-Islam in his writings. 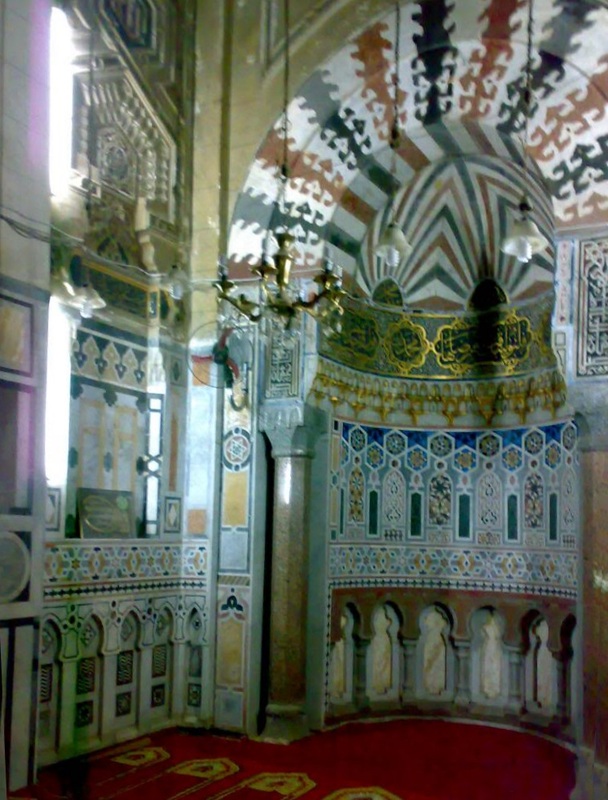 Photos from the maqam of Al-Sultan al-Hanafi. 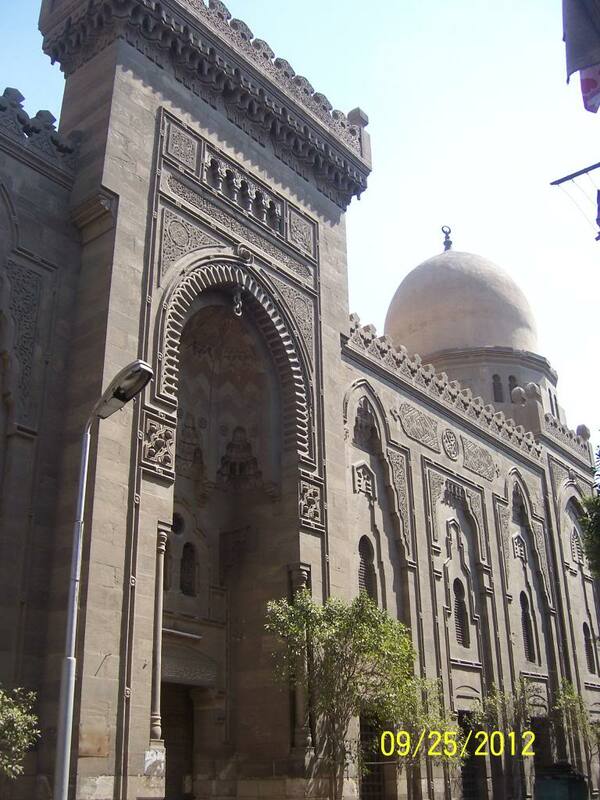 The mosque it is located outside Cairo, and the Shaykh himseelf laid its foundations in the beginning of the 9th century hijri – may Alllah be pleased with him. His son-in-law Sidi ‘Umar (mentioned in the bioraphy as one of his students) is buried there as well.